In order to book an appointment with Istiqdam for processing permanent family visa in Saudi Arabia, Expatriates have to book an online appointment with Jawazat in Istaqdam through Ministry Of Interior Saudi Arabia website. For Permanent Family Visa detailed process read this article "PERMANENT FAMILY VISA IN SAUDI ARABIA". 1. Istiqdam Form, Signed and Attested by your company and Chamber Of Commerce (COC). 2. Salary Letter from company in Arabic, Attested by Employer and Chamber Of Commerce (COC). Letter should Include details like Basic Salary, House Allowances, Transportation etc,. Appointments are updated every Sunday from 7.30AM to 8.00AM for every next week. For booking appointment you need MOI Abshir account. Once you get it proceed with below steps. - Login to (MOI) Ministry Of Interior Saudi Arabia Abshir Account, Go to E-SERVICES tab from the above menu, Then select "ISTIQDAM" from left menu. 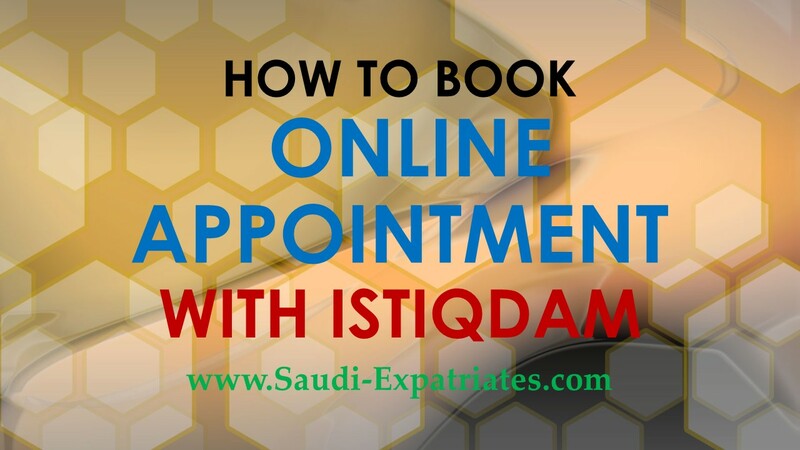 - When you click on Istiqdam, You can see an option of "BOOK AN APPOINTMENT", Click on it and goto "PROCEED TO SERVICE". - This service allows expatriates to choose any of these services "Book an Appointment", "Update an Appointment", "Print an Appointment" and "Cancel an Appointment". - If you proceed with "Book New Appointment" in Istiqdam, You can see a new page, Where you can select "Apply Recruiting resident family" for permanent family visa appointment, Then choose your "Region" and hit the "Next" button. - Now you can able to see one appointment available on your screen in your selected region, You can click on "Select" and book your appointment. - It will display all the required documents, Hit "Confirm Appointment Details". Take a printout of an Appointment, Include it with your required documents while visiting Istiqdam office. I saw a new link beside "Book an Appointment" that says "Family Visa". Is it the link for applying family permanent visa (Iqama Visa) online? Yes, It seems MOI launched this service newly. I can not able to Nationality column while completing my application. It does't give me an option of nationality for my dependent. 2- what should we do after getting chember attestion .. need more clearifications pls..
3- when we recieve the sms for approval... and after that what we can do with this approval messge.. It is not clear, whether you are talking about online procedure or manual. I wanted to apply for Permanent family visa last month however, I found that I need to book an appointment, so I logged in to ABSHIR account I got appoint for 31 march which I felt that time its quite long, Then I decided to apply for visit visa and the MOFA approved the visa for my mother and wife which is not stamped yet, I don't want to call my wife on VISIT VISA, I want to wait till my appointment to apply for family visa, PLEASE TELL ME WILL THEY APPROVE MY FAMILY VISA(I ALREADY HAVE COMPUTER PROGRAMMER PROFESSION, MY DEGREE ATTESTED & translated and MY MARRIEAGE CERTIFICATE ATTESTED AND TRANSLATED) and issue me a yellow slip??????? You can try for that, Just 1 day more for march 31. I GOT APPOINTMENT IN ISTIQDAM ON 9-4-2015 TO GET VISA FOR MY 2 YEAR OLD SON.IF THEY APPROVED MY APPLICATION CAN I GET IMMEDIATLY VISA ?OR IF THEY NOT APPROVED CAN I GET MY APPLICATION BACK? Inshallah you will get it at the same time.